Over the many years that Ani Migme, more formally known as Gelongma Migme Chödrön lived at Gampo Abbey she touched 100s of different peoples’ lives. If you have a personal story or photo of your time with Ani Migme that you would like to share please post them here in this blog. We want to create a space where the richness of her life can be shared. Sorry to hear of Ani Migme’s passing. While I stayed at Gampo Abbey, she acted as a protector/activist for animals as well as an elder for the community, translator. Ate lunch with her a few times, appreciated her wit, humor. But vision from your good eye remains. Painted by your marooned vajra sisters and brother. Your mind is clear and at peace. Even while dying, you are orchestrating daily practice. This will always be your house. Such a peaceful poem. Thank you for sharing Linda L.
I would not be a Shambhala Buddhist if it were not because of Ani Migme and her late husband, Harry Habgood. 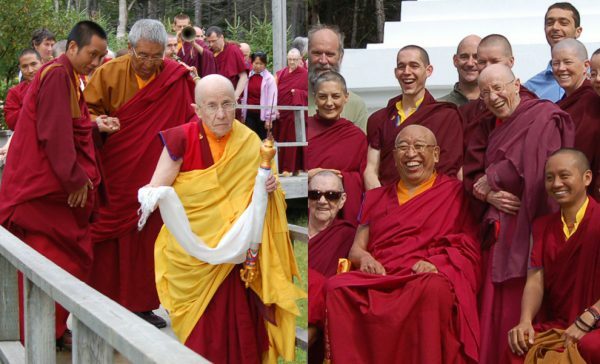 They both founded the Edmonton Dharma Study group in the late 1970’s: I was living in Edmonton at the time and my first encounter with buddhism was at their home. That is where we sat every other Sunday (now called nyinthuns) for the whole day. There was mostly just 3 of us; because Ani Migme had started this group I learned quite quickly about shamatha meditation. 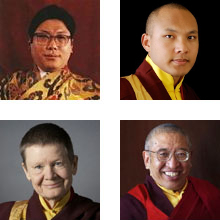 Also because of my connection to the Dharma Group she had founded, I got to meet the 16th Gyalwa Karmapa in 1977 when he went to Western Canada and gave the Black Crown ceremony in Calgary. Ani Migme also organized a “Welcome to Canada” reception in Calgary for the Vidyadhara, Chogyam Trungpa Rinpoche shortly before he travelled to Lake Louise for the 1979 Seminary. So because of her dharmic activity I was able to meet my root guru for the first time. I would probably not be on the path today if it weren’t for Ani Migme’s tireless compassion and activity. Ain’t nothin but a ‘thang. When I was in my first year at Gampo Abbey I met Gelongma Migme. The impression of having met Vajrayogini has never left me and my memories of her are imprinted with that presence. I visited the Abbey to help with the landscaping for the stupa and met Ani Migme over lunch. She was always laughing and full of life. Lunch with her was a pleasure. I was impressed with the strength of her dedication and perserverence in spite of seemingly fragile health. When I left, she made me promise to come back some day and I did, but haven’t been able to meet that promise as of yet. When I think of her, I feel so happy for a life well lived! Here is a little video I did in 2012? I remember it was during a 2 days electricity blackout, when the Abbey became very cold. Appologies for the double conversation disturbance.